Nocatee Teens Enjoy Splash Park Scavenger Hunt Challenge! 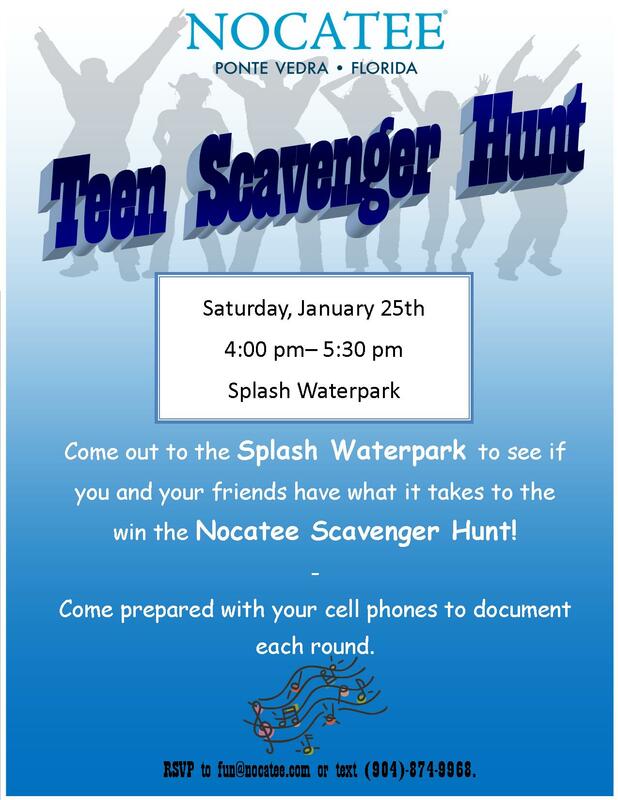 Nocatee invited teenage residents to participate in the first-ever Nocatee Scavenger Hunt event on Saturday, January 27th! This fun community event challenged teams of teams to complete, and then document (photograph) all twenty fun and wacky tasks that were completed throughout Splash Water Park. Residents and their friends enjoyed the sunny, lively atmosphere as DJ Jonathan spun tunes in the poolside Splash Park Cabana. Fun community events, like these, are always highly anticipated as it provides a fun family-friendly way for residents to spend their day or evening right at home. Nocatee’s Splash Park is an especially popular event setting due to its various amenities. Additionally, the interactive water-playgrounds, lazy river, giant water slides and in-house zip line are all great ways to stay active while having fun. Everyone enjoyed this new community event, and the winning “Mike Wazowski” team also received a Nocatee cup, sunglasses and croakies as first-place finishers!